Want to grab best deals but don’t want to wait in line? Go online with Cyber Monday sale, shop for your favorite gadgets and electronics from the comfort of your home. It is the absolute mega online holiday sale for those who missed out or were unable to cash in on Black Friday. Cyber Monday is the name given to the Monday after Black Friday. This year it falls on November 27th, which lies this coming Monday. Since many online stores have already started offering deals in name of Cyber Monday, why miss out on them? As it is rightly said, the best deals sell out first, so be ready with your shopping list to get the best out of this sale. Below is a short insight on the history of Cyber Monday followed by tips to stay safe when shopping online. Black Friday marks the beginning of shopping season, but Cyber Monday is the show stopper for Thanksgiving. In 2000 retailers noticed a sudden rise in the use of internet for shopping purpose which became a trend so in 2005, the Monday after Thanksgiving was named Cyber Monday or Cyber Week. Cyber Monday stretches the online sale for seven days after Black Friday sale ends, so that everyone gets what they want. E-commerce business is gearing up, people now like have shops and stores at their fingertips rather than standing in queues. Unlike window shopping, they love to checkout different deals, compare them and grab the best one. Online shopping gives them this at ease and thanks to various online shopping portals, they can lookout for lighting deals, deals of the day and grab them at earliest. To make things more convenient you can also download apps that provide timely updates on the hottest offers and deals. So, what are you waiting for stop by get your shopping list ready and start shopping! But in this hurry, don’t forget that every coin has 2 sides you need to flip it to see the darker side. Online shopping is a bliss not only for you, but also for cyber criminals. They are getting proactive to lure you with the tailored online scams. All it requires is a single mis-click and you might end up being victimized by such scams. Therefore, it would be worthwhile if you follow these tips to save yourself from being a victim this Cyber Monday. Public Wi-Fi is something that always attract our attention and we are tempted to use them to save data. But do you know Free Wi Fi acts as a bliss for hackers. Using them they can easily get access to your device and then can hack your data as public Wi Fi lacks active security. Hyper Text Transfer Protocol Secure (HTTP) connection is used to transfer data between your browser and the E-commerce website that you are connected to. When a site uses HTTP, the data is sent in plain text which can be easily read by the hacker and exploited. Therefore, it is recommended to use (HTTPS) instead of HTTP as it is a secure version. When data is sent through HTTPS it is encrypted making it difficult for the hacker to intercept that makes it secure. To implement HTTPS connection, Ecommerce sites need a valid SSL certificate. Watch out for the deals that look lucrative and offer you huge discounts with gifts or additional benefits. There’s a high probability that these are made to scam you. Scammers pretend to be real but they aren’t they use a fake site to attract and make it hard for you to resist the temptation. So, Beware! There is nothing for Free. You aren’t that lucky even if you try to be optimistic for that moment. Avoid using same passwords for mobile apps and E-commerce website. Use different and complex passwords to stay safe. Make use of alphanumeric passwords with special characters and a combination of capital letters. When you create register yourself for a new account provide only the basic information required to get the account activated. There’s no need to answer any security question shown on the E-commerce site while making the purchase. It may be a scam to get more details from you. Download apps from app store only don’t trust third party sites for downloading apps offering apps discounts. Keep a check on the app permission before you grant access. If any app permission looks suspicious or unwanted don’t grant access. During this holiday season as scammers know you will be searching for apps offering discount coupons. They take advantage of it and upload such apps that looks promising but are made to steal your login credentials and credit card information. 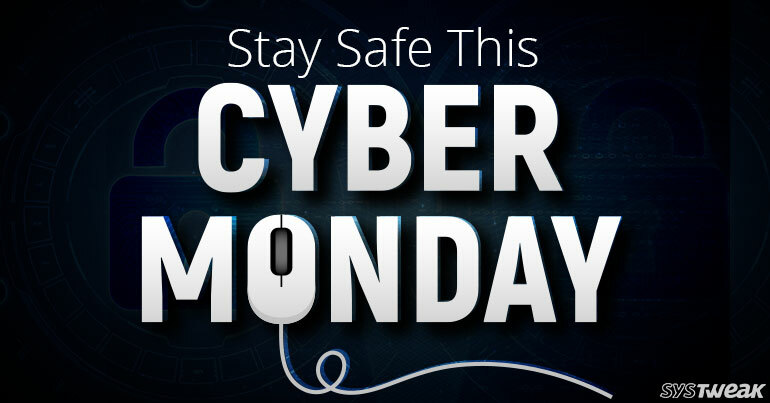 We hope these tips to stay safe this Cyber Monday will help you grab the best deals, while being protected at the same time. Keep these simple rules in mind to stay clear from online scams. So be safe and enjoy shopping this Cyber Monday.